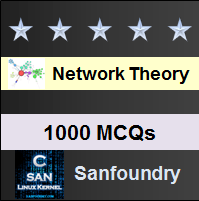 This set of Network Theory Multiple Choice Questions & Answers (MCQs) focuses on “Nodal Analysis”. 1. If there are 8 nodes in network, we can get ____ number of equations in the nodal analysis. Explanation: Number of equations=N-1= 7. So as there are 8 nodes in network, we can get 7 number of equations in the nodal analysis. 2. Nodal analysis can be applied for non planar networks also. Explanation: Nodal analysis is applicable for both planar and non planar networks. Each node in a circuit can be assigned a number or a letter. 3. In nodal analysis how many nodes are taken as reference nodes? Explanation: In nodal analysis only one node is taken as reference node. And the node voltage is the voltage of a given node with respect to one particular node called the reference node. 4. Find the voltage at node P in the figure shown. Explanation: I1= (4-V)/2, I2= (V+6)/3. The nodal equation at node P will be I1+3=I2. On solving, V=9V. 5. Find the resistor value R1(Ω) in the figure shown below. Explanation: 10=(V1-V2)/14+(V1-V3)/R1. From the circuit, V1=100V, V2=15×2=30V, V3=40V. On solving, R1=12Ω. 6. 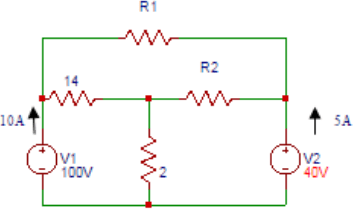 Find the value of the resistor R2 (Ω) in the circuit shown in the question 5. Explanation: As V1=100V, V2=15×2=30V, V3=40V. (V1-V2)/14+(V1-V3)/R2=15. On solving we get R2= 6Ω. 7. Find the voltage (V) at node 1 in the circuit shown. Explanation: At node 1, (1/1+1/2+1/3)V1-(1/3)V2= 10/1. At node 2, -(1/3)V1+(1/3+1/6+1/5)V2= 2/5+5/6. On solving above equations, we get V1=6.32V. 8. 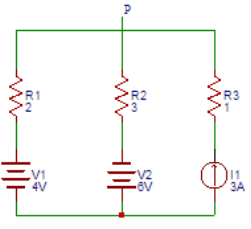 Find the voltage (V) at node 2 in the circuit shown in the question 7. Explanation: At node 1, (1/1+1/2+1/3)V1-(1/3)V2= 10/1. At node 2, -(1/3)V1+(1/3+1/6+1/5)V2= 2/5+5/6. On solving above equations, we get V2=4.7V. 9. Find the voltage at node 1 of the circuit shown below. Explanation: Applying Kirchhoff’s current law at node 1, 10= V1/10+(V1-V2)/3. At node 2, (V2-V1)/3+V2/5+(V2-10)/1=0. On solving the above equations, we get V1=33.7V. 10. Find the voltage at node 2 of the circuit shown in the question 9. Explanation: Applying Kirchhoff’s current law at node 1, 10= V1/10+(V1-V2)/3. At node 2, (V2-V1)/3+V2/5+(V2-10)/1=0. On solving the above equations, we get V2=14V.